Hi Tech Boat, Inc., the new subsidiary of Blount Marine Corporation of Warren, R.I., recently entered into a contract with Fire Island Ferries of Bay Shore, L.I., N.Y., to supply a super-fast commuter boat of revolutionary new construction. The vessel, to be delivered in July, will measure 75 feet by 21 feet. Its 75-foot hull is believed to be the lightest ever built for its strength, and it will draw less than a foot although propulsion and anti-sliding devices will bring the total draft to about 26 inches. Of composite sandwich construction, the vessel will be built around a skeleton of aluminum, stainless-steel, and foam material, with a hull skin of fiberglass. The vessel, in light ship condition powered by twin GM 12V71 diesels, will weigh a total of only 22-tons compared to a lightly built 75-foot steel commuter weighing 46 tons. The vessel will operate on a run between Bay Shore, L.I., and Fire Island, where extreme shallow draft and speed is important. Speed of the new vessel is expected to exceed 30 miles an hour with less power than required by steel 20-mph commuter boats of which Blount has built a total of five over the last seven years. To fulfill the need for a superfast, light-duty workboat, Blount Marine has established a new division, Hi Tech Boat, Inc., that will build and market the new specially built craft based on the Blount patent. The project is the result of an invention developed and patented by Luther H. Blount in 1981. 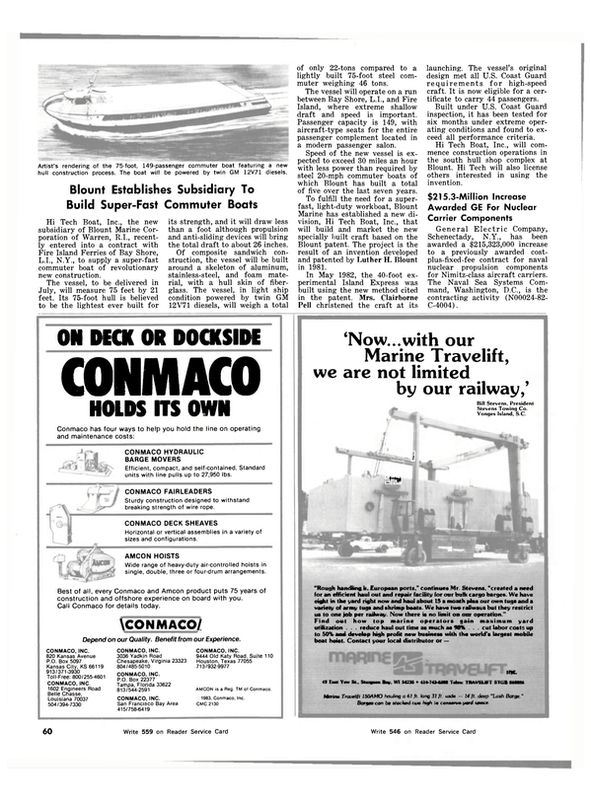 In May 1982, the 40-foot experimental Island Express was built using the new method cited in the patent. Mrs. Clairborne Pell christened the craft at its launching. The vessel's original design met all U.S. Coast Guard r e q u i r e m e n t s for high-speed craft. It is now eligible for a certificate to carry 44 passengers. Built under U.S. Coast Guard inspection, it has been tested for six months under extreme operating conditions and found to exceed all performance criteria. Hi Tech Boat, Inc., will commence construction operations in the south hull shop complex at Blount. Hi Tech will also license others interested in using the invention.